We are not alone. Every year thousands of immigrants line up, hoping to slip smoothly through Immigration's sieve. But for many, like us, it's not so easy. As a family of New Zealanders and one American (me), we mistakenly assumed we would receive a warm welcome. But in 2001 the Howard Government had pulled in the reins on what once was an open and hospitable come-and-go policy between Australia and its neighbour across the Tasman. So, by the time we hit the border in 2002 we were handed a wad of forms the size of a phonebook and pointed in the direction of the Immigration Department. And that's where our difficulties began. Two of our young children have an inherited medical condition, a fact which doesn't win you any bonus points in the permanent residency system. In fact, it got us turned down. After our rejection letter arrives we decide to appeal the decision to the Migration Review Tribunal (MRT), where we will join another 5000–8000 or so others, all hoping someone will listen to their story and re-think their rejection. We read on the website that in a given year only about 50 per cent of MRT applicants succeed. Not encouraging statistics; however, for those facing the Refugee Review Tribunal only about 30 per cent get through. Initially we are told our case should be heard by the MRT within six months. Instead, it is over a year before we are allowed to submit our defence in writing. Nearly three years will pass before our day in court and another six months before we are given an answer. As the weeks and months pad on, we try to adapt to our uncertain status. We settle in, choosing to live like people who have a future in this country. After more than five years here our three young boys are more Australian than anything else. They play cricket and footy, sing the national anthem, recognise the nation's leaders and its history, consider themselves natives. Watching our son sing 'I Still Call Australia Home' in his school concert feels like a family pledge of allegiance. We struggle against being ruled by the Immigration Department, refusing to believe they alone will determine our future. I plant a vegetable garden, raise chickens. We buy a house, reassuring the kids that this is our home. But the questions linger. Should we give up and return to New Zealand? Or stay here and battle the heartless immigration department; here, where the children adore their schools, where we have work and a community we value, where our life has come to be; here, in the Australia we love? Can we stay in a country that rejects us, our skills, our contributions, our children? A country that views us as a burden it would rather not bear? Being a hostage to the Immigration Department affects us. There are tears of joy when the 43 asylum seekers from West Papua land on Australia's northern coast. We cheer when they receive Temporary Protection Visas. At a rally for the West Papuans, we hear them share, through testimony and song, the beauty of their culture and the deep fear for their people's future. Reading stories of Iraqi and Afghan refugees kept waiting for years in offshore detention centres is disheartening and reminds us how much worse things could be. Clearly our circumstances are not in their league, except we have all had our future put on hold. It's astonishing that anyone ever gets past Immigration, the Australian gate-keeper, especially those without deep pockets. The application and appeal fees run over $3000, another $1800 for the medical exams (repeated for three of us after they 'expired' due to the slowness of the application process), and a $5000 no-interest bond. We are even forced to pay $300 for the Department to determine whether my husband's PhD from Stanford University is equivalent to an Australian degree. Then, of course, there are the lawyer's fees. Attempts to speak with the Department require extraordinary humility and a morning to kill listening to recorded messages. The staff ... well, let's just say they are generally not laying out the welcome mat for us would-be immigrants. The illogical nature of their policies is puzzling. As New Zealanders, our children still have access to the Australian health system and have the right to remain. Granting them permanent residency won't actually cost the government anything. We try to explain the lunacy of it, but nobody's listening. The entire process is humiliating: the interminable phone calls, the state of limbo, the failure to keep to timelines, missing them by years rather than months. On our first trip out of Australia we are pulled out of the line at Immigration; our sons' passports triggering a warning. (Are they worried that we are leaving the country? We thought that was their aim.) This embarrassing experience is repeated every time we enter or exit Australia. We fudge to the kids about the hold-up, not wanting our 12 and nine-year-old sons to recognise that they are the problem. Then, finally, we are called in to hear our decision. Squashed in a small, sterile room with half-a-dozen other hopefuls, we wait as the case names are called and the decisions read aloud. The man before us loses his appeal; he looks confused, uncertain. What will he do now? The MRT decides in our favour. Although a huge relief personally, it feels like we're escaping from a burning building, leaving others trapped inside. The irrational policies remain. So too, the piles of paperwork, high fees and unhelpful culture of the Department, through which applicants must wade for years. The Labour government's decision to end the Pacific Solution, closing offshore detention centres, is surely a first step toward a more humane system for immigrants. Thankfully, this is the end of our family's dealings with Immigration. Although long frustrated by unthinking immigration policies, we underestimated the impact they might have on our own life. Hopefully our years-in-waiting have taught us the importance of treating all people, Australians and wannabee-Australians alike, with respect and dignity. Until we do that, we can never stand tall. Susan Biggar, a Melbourne writer, holds degrees from Duke and Stanford universities in Politics and International Policy. She has written for international development agencies as well as such publications as The Age, The Big Issue, and Australian Doctor and Mothering. In 2006 Susan won a National Literary Award for a short story. Recent articles by Susan Biggar. Thank you Susan for your letter. We need a Kafka to describe the immigration department, though I fear they've read him already and think he's a text book. Thank you for some enlightening insights into the ordeals of the many ordinary humans in the quagmire of immigration. You expressed the sufferings and uncertainty in dealing with Immigration is a very clear and satisfaying way. I worked a lot with young people on TPV's for the past few years, and have seen first hand the suffering it inflicts on the individual andthe family (many of whom are in fact overseas waiting the results of the TPV to be able to come. Susan, thank you for sharing your story. Your story is just further confirmation of the ineptitude of the immigration department.I don't think 'respect and dignity' register with the department, but it is interesting to hear that this treatment is dealt to both would-be migrants and those seeking asylum. I can sympathise with Susan Biggar, and don't doubt a word that she says. I live in an Australian/American/Canadian family and have had experience with the immigration departments of all three countries. Although it will be cold comfort to her, the American and Canadian authorities are every bit as frustrating as the Australians. This article puzzles me. Why does the author suppose that the Immigration Department should simply lay out the welcome map for would-be migrants? One of its functions is precisely that of a "gate-keeper". Applicants for residence in Australia are not entitled to waltz into the country without further ado, especially not in these times of heightened security concerns. Australia is not an endless cornucopia of largesse - ask struggling working families in Western Sydney and other places. Surely the author is not likening her situation to that of Iraqi, Afghan and West Papuan asylum seekers. Having tried to assist someone negotiate Dept of Immigration I understand Susan's terrible frustration and "panic". I feel ashamed too. i know the USA is as bad or worse - no argument to behave badly. Sylvester, there is no argument with the need for "gatekeepers". The problems are the length of time taken, the crude ineptness,the ignorance in the dept of its own policies and procedures, the lack of couresy. 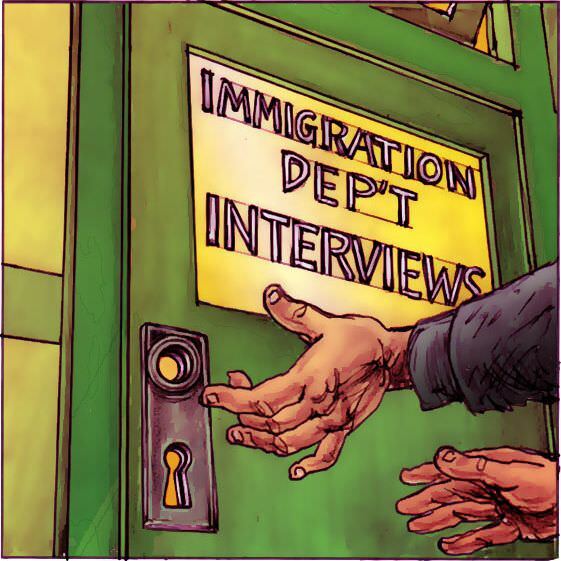 The person I was assisting ended in a terrible mess on one occasion, missing all the deadline dates because a letter had been addressed to Mr instead of Ms.
Susan, your letter makes me feel ashamed of our Immigration Department but one phrase stood out for me: "we try to explain ... but nobody's listening". Surely if they listened more they would save a lot of time and hurt for all concerned. Your experience, Susan, while embarrassing for me as an Australian, is typical of bureaucracies everywhere. See if you can get a copy of the recent NZ movie We're here to help, a true but harrowing story. It's quite insightful. As a registered migration agent, the article reinforces to me the necessity to brief clients about the potential to wait for long periods, to be treated not as they would treat people, and to be publicly humiliated when they are given the final decision in a semi-public environment. INTERESTING, AND QUITE WELL WRITTEN. I used to work with your sister Ann in Napa and have recently moved to Oz with my Aussie husband and newborn son. Ann sent me this link on FB. My application is about to be lodged and a pray it doesn't mirror your experience.